Kesar Pista Shrikhand in 30 minutes! This recipe takes me less time than running to the store to get shrikhand. Plus I used nonfat Greek yogurt and had the Shrikhand that rose in peaks! Perfect in taste and consistency- Kesar Pista Shrikhand in 30 minutes! The dish is practically vertical in the photo, but the Shrikhand does not slide at all! Traveling back home from Los Angles, I am thinking of my blog post for today. With all the fusion Vietnamese, Cajun, Indian and Mexican recipes I ate there, I am going crazy with ideas for my blog post. But with Dassera tomorrow, I decide to make Shrikhand. 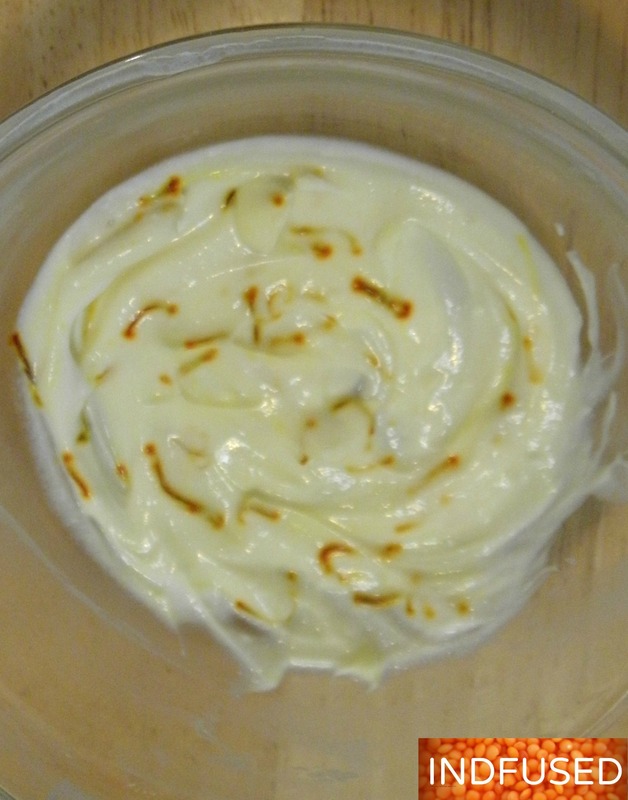 Shrikhand is the sweet made of yogurt, sugar, saffron and cardamom. Growing up in Maharashtra, India, I felt like the various festivals that were celebrated all year long, had specific sweets assigned to them. Shrikhand to be eaten with puri, the fried puffy bread, was made on auspicious occasions like Dassera and Paadwa. 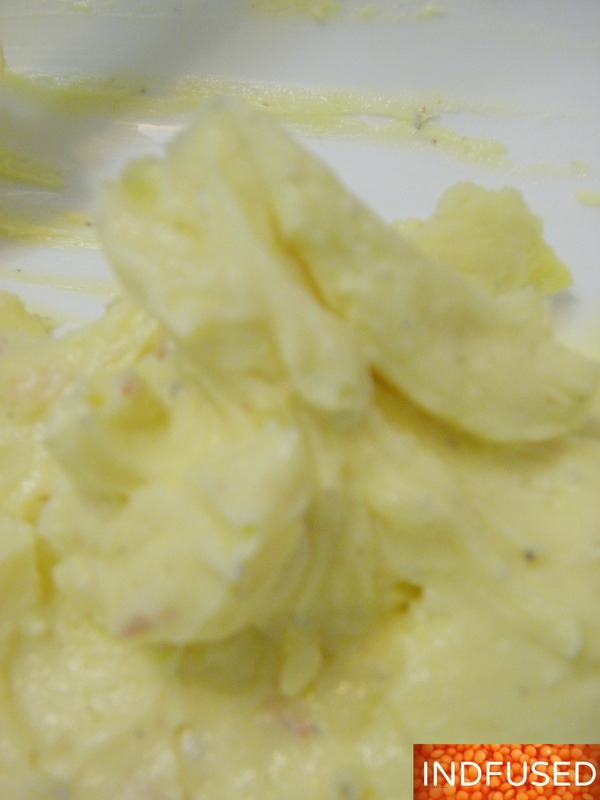 Shrikhand is traditionally made with plain yogurt that is tied in cheesecloth and hung to drain. This process takes at least 8 hours, if not overnight. 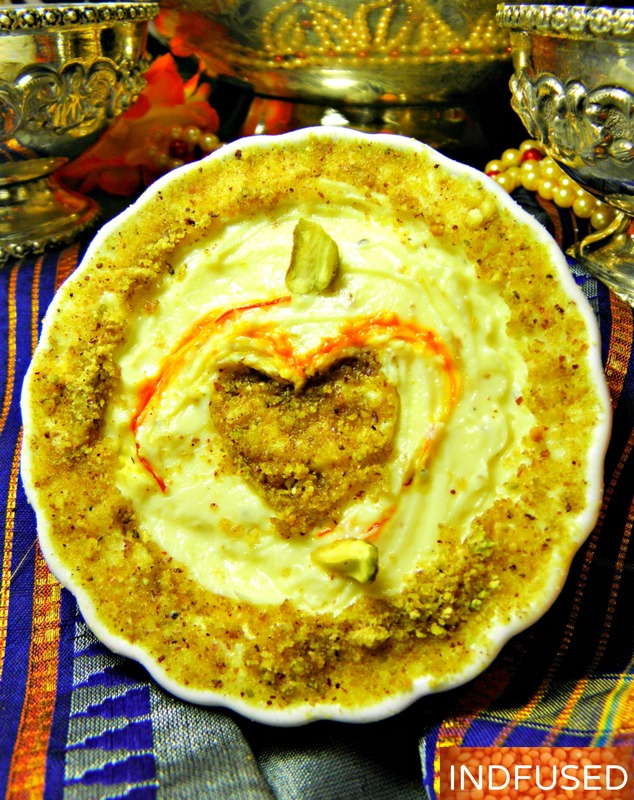 The solids are then mixed with sugar, saffron and cardamom powder and topped with nuts. With Greek yogurt becoming so popular in recent years, many of us thought how we could make shrikhand in an instant. But Greek yogurt becomes runny when mixed with sugar. The thick texture of the shrikhand is just as important for that authentic taste, so we were disappointed. Hence my experiment today! I am happy to report that shrikhand lovers will truly appreciate this 30 minute recipe for its taste and for the texture- I have shrikhand that rose up in peaks when I whisked it! Yum! I started with a cup of store bought, plain, nonfat Greek yogurt. I like the Kirkland brand at Costco. I put it in a double cheesecloth. 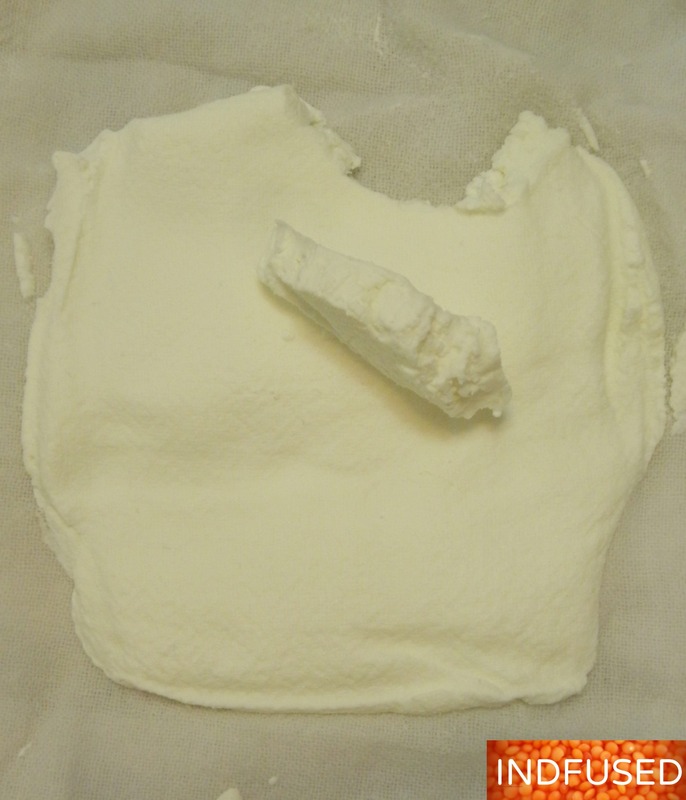 Plain, nonfat, Greek yogurt in cheesecloth- note the change in consistency and texture just 25 minutes later! And covered it all around with paper towels. 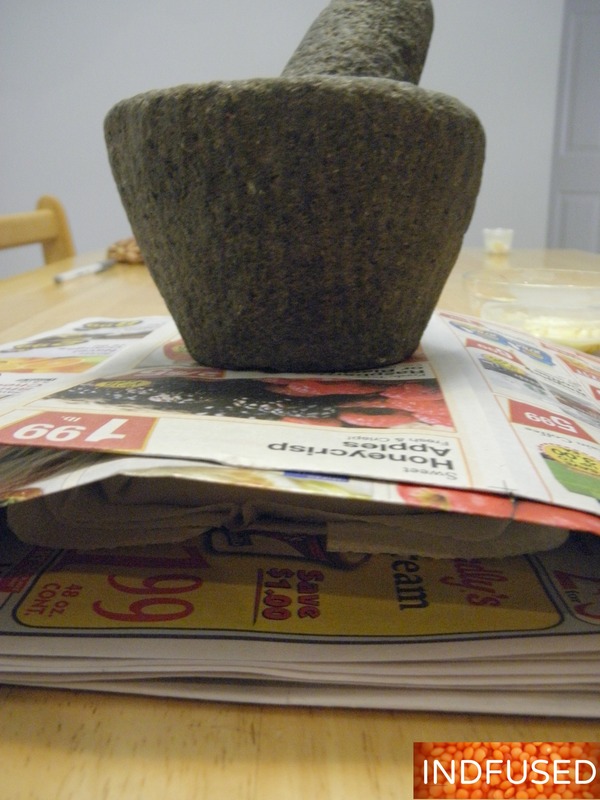 Then sandwiched this package in paper towels between 2 stacks of newspaper ads and placed a heavy weight on it-in this case my stone mortar and pestle. Leave it alone for about 25 minutes. This method helps get rid of the extra liquid/whey in the Greek yogurt in such short time. Meanwhile, I take a fat pinch of saffron strands in a microwave safe bowl and warm it for 20 seconds. Then I add 1 teaspoon of Greek yogurt to it and stir well to combine, and set it aside. I gather the 3 other ingredients. After 25 minutes, I remove the mortar and pestle weight, throw away the soaked newspapers and paper towels and open my cheesecloth package. 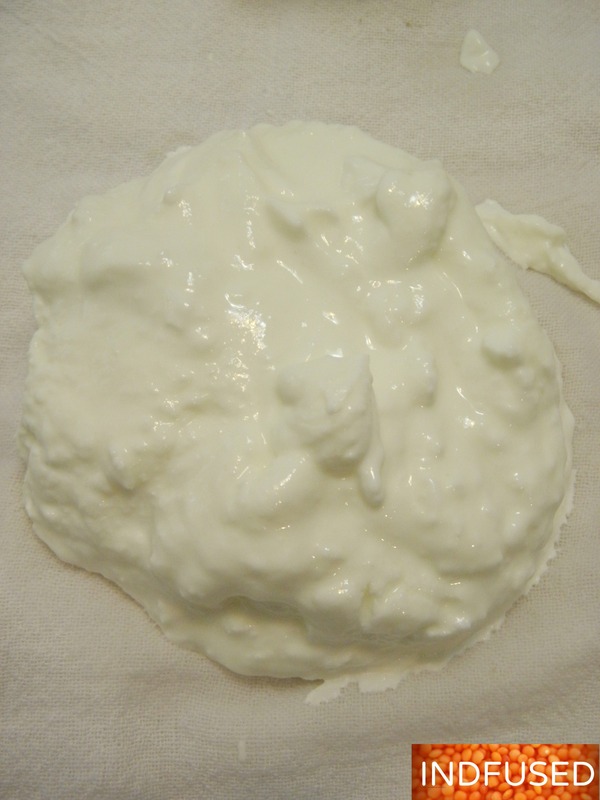 Look at the texture of the yogurt in just 25 minutes! Check the texture of the yogurt in just 25 minutes! Add the saffron and yogurt mixture, sugar, salt and the cardamom powder and whisk together. Look at the shrikhand peaks! The whisked yogurt stands in peaks- the perfect consistency for Shrikhand! The color deepens more as the saffron lends its color. 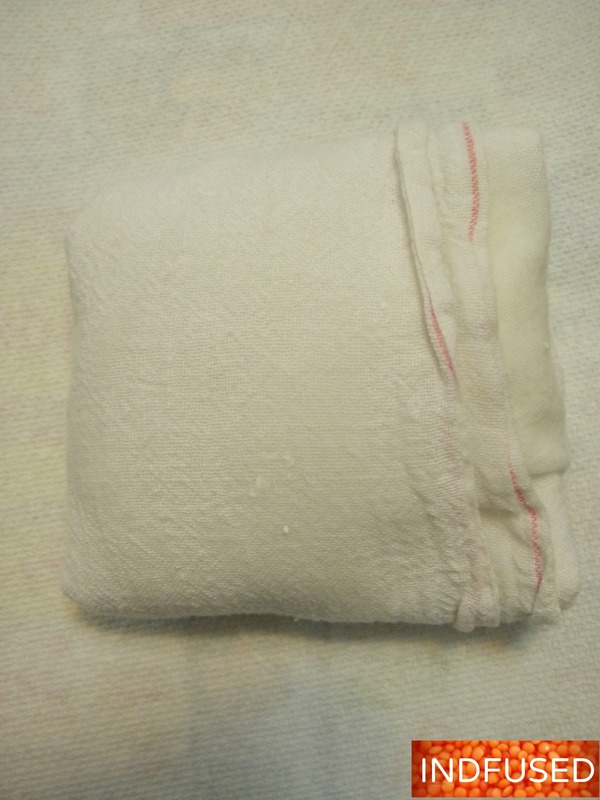 Wrap the 1 cup of Greek yogurt in a double cheesecloth. 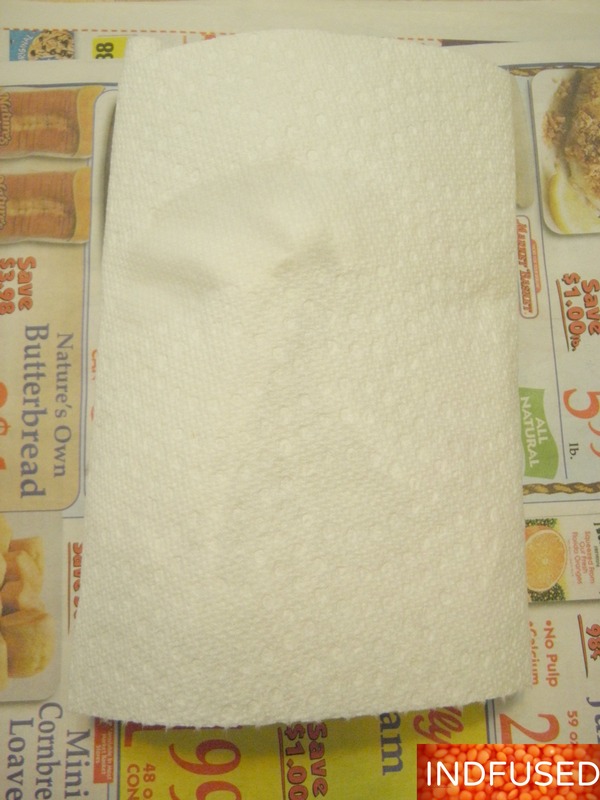 Wrap paper towels over it and sandwich it between layers of absorbent materials like newspapers or extra paper towels. Weigh it down with a heavy object or weights. Set aside for about 25 minutes. In a small microwave safe bowl, warm the saffron strands for 20 seconds in the microwave. Add the 1 teaspoon of Greek yogurt, stir well and set aside. Remove the drained yogurt in a bowl. Add the yogurt with saffron, sugar, cardamom seed powder and salt and whisk the mixture until the sugar dissolves. Remove to a serving bowl. Top with the powdered pistachio nuts, if using and serve with puris. Hope you enjoy this quick and easy Kesar Pista Shrikhand this Dussera! Another very clever idea. Even if I don’t use your short-cut method, I intend to give this one a try too. Do try it Hilda. It tastes awesome! Thank you Ronit. Shrikhand is a classic Indian sweet for festivals and I am happy that this experiment worked out so well. It tastes just like the authentic one and cuts the time by 8 hours or so! Thank you Greg! Shrikhand is one of those classic sweets. So I am happy that this recipe came out so well. Loved your version Sandhya. Today I will make this and let you know! Thanks Uma. Hope you like it as much as I do. Thanks so much Loretta! Shrikhand is the ubiquitous sweet for many festivals in Maharashtra. But the strained yogurt called chakka is readily available in the market.The yogurt is generally drained overnight. So I was happy that I could come up with a quick and easy method using Greek yogurt. Yes I agree about eating it in this heat. Looks so appetizing, can I add less sugar?